I'm really beginning to think that Harris County District Attorney Kim Ogg skipped the day they taught diplomacy at politician school. KPRC Channel Two is reporting this evening that the D.A. 's Office suddenly revoked the City of Houston Police Department's access to the Consolidated Criminal History Database (CCHD) without warning. The database is an extremely handy website available to all prosecutors and apparently, all (but one, now) law enforcement agencies in Harris County. The way it works is that it gives the user the ability to enter the name of person and that person's entire Harris County criminal history pops up. It shows every case the person was ever charged with, as well as the outcome of those cases. That information is something that is readily available via a standard NCIC/TCIC criminal history check, but the CCHD gives much more detailed information. Each listing of a criminal case provides links to a tremendous amount of additional information. In most cases, each case is linked to the offense report. It may also link to all the persons involved. It can provide information on where the crime happened and past known addresses of a suspect. In many cases, it even has digital downloads of audio and video recordings. It is a valuable asset for prosecutors and police agencies. Here's why. Let's say that the Houston Police Department is working on a case and they are looking for a suspect. They enter his name into the CCHD and it shows that he's had several cases filed on him by the Harris County Sheriff's Office, the Constables, or Pasadena. The CCHD provides an easy click to read the offense reports from those other agencies. It allows the multiple police agencies within Harris County to quickly access each other's relevant information, without having to go through the (sometimes painfully slow) process of reaching out to each other and asking for that same information to be shared. It puts local criminal history at an officer's fingertips. Defense attorneys even have (a very limited) access to it for their clients. When I have signed on as attorney of record to a case, I can use the CCHD to look up my client's criminal history and have access to all of the old offense reports related to it. It is an amazing website that makes my job so much easier. I can see the related offense reports, get interviews, and see evidence on cases where my client was charged. It saves the prosecutors an immeasurable amount of time because they don't have to make copies of everything and provide it to me. But the irony is that now I have access to something that the freaking City of Houston Police Department does not. HPD. The biggest law enforcement agency in the county. It's hard to decide where to begin with this, but I'll give it a shot. When Kim Ogg fired decided not to renew the contracts of approximately 40 senior prosecutors in her new regime, she sent a very loud message that she was not to be trifled with. She clearly had her own vision of the direction she wanted to take the Office and she wasn't really too bothered by the opinions of those who disagreed with her. Ogg was more than happy to take on the ire of the police agencies when she decided to stop taking felony charges on residue or "trace cases" or small amounts of marijuana. Those criticisms were to be expected for a "progressive" District Attorney. But recent public complaints from HPD to the media have apparently pushed Ogg over the edge. Some members of HPD have been complaining of prosecutors pleading out cases for too little punishment. Ogg's way of dealing with the criticism was to simply ban her prosecutors from talking to the police about what was happening. 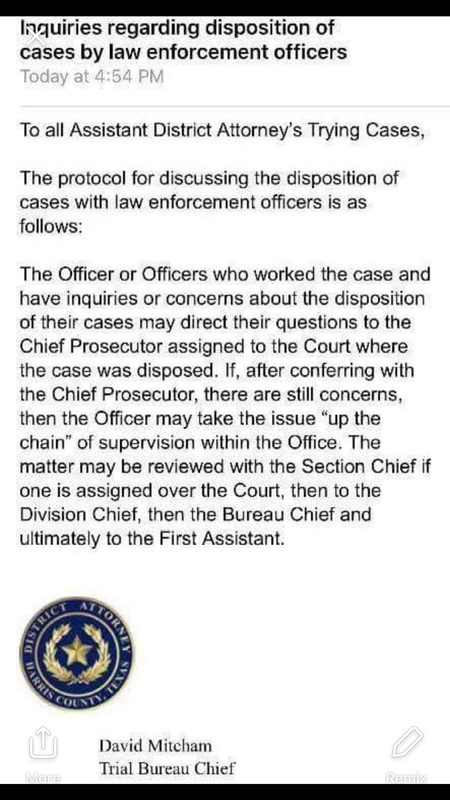 This memo in and of itself is pretty telling about the deteriorating relationship between the Ogg Administration and surrounding police agencies. The very idea that police officers who worked on cases aren't allowed to speak to the prosecutors who handled those cases is absurd. OFFICER: Hey, are you the prosecutor that handled that Agg Assault on a Public Servant case where the suspect shot at me? ADA: I'm sorry, sir. I can neither confirm nor deny that. OFFICER: He got probation. What the hell happened? ADA: Sir, you may speak to my supervisor if you are displeased. OFFICER: Aren't you the prosecutor who handled it? ADA: I can neither confirm nor deny that. Would you like my supervisor's name and number? But even that pales in comparison to the idea of shutting the county's largest police force out of a shared database. In essence, Ogg has responded to the criticisms by withdrawing access to an investigative tool. That could be construed as a declaration of war. And that probably wasn't the best decision she could have made. This war is not one that Ogg can win. 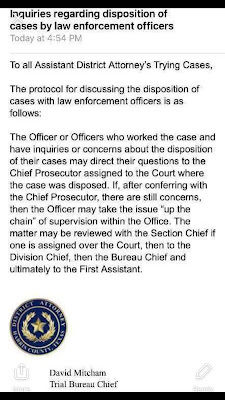 Suppose HPD decides to retaliate by blocking access to their databases to all HCDA personnel? Prosecutors who want an offense report will have to request a printed version that is copied and turned over to them. What would happen if every name an HCDA investigator wanted to look up was no longer available at the push of a button? It would bring the D.A. 's Office to a standstill. What would the D.A. 's Office do then? Stop filing all HPD cases? Good luck with that. What Ogg is withholding from HPD will inconvenience them. If they retaliate, they could devastate a D.A. 's Office that is already reeling from the side effects of Hurricane Harvey. I'm sure there is more to the story than is currently in the media. Ogg giving a comment might help enlighten us. The fact that she isn't in front of a camera, sharing her side of things is telling. It will be interesting to see how this all plays out. If we know nothing else about Kim Ogg, we know that she doesn't back down from challenges very often. No matter how devastating the repercussions. I heard that your upper admin recently started some new thingy called "Selfies and Plans for Success" or something like that. If I understand it correctly, the "Selfies" component is for each prosecutor to keep a file on his or her computer of all the professional accolades accumulated over the years. I'll be honest with you -- it seems a little silly to me. Prosecutors are too busy working their butts off these days to take time for patting themselves on the back. Self-aggrandizing is really more of a sport for the politicians. Not to sound too much like a grumpy ex-prosecutor, but back in my day, the upper admin knew the difference between the great, good, average and bad prosecutors. They watched them in trial. They read their evaluations. They didn't ask them to make a "sizzle reel" as if they were trying out for American Idol. Harris County prosecutors are the best in the business. Now, I know I'm biased since I'm a former Harris County prosecutor and all, but over the past nine years I've spent in private practice and the last five years I've spent consulting on other projects, I've had the chance to see quite a few more jurisdictions than I had before 2009. I've dealt with prosecutors in numerous other counties and numerous other states. I'm not saying anything negative about the ADAs in those other locales, but there are few that can compare to a seasoned Harris County prosecutor. Harris County prosecutors have seen every type of case and prosecuted it. They know the rules of evidence like the backs of their hands because they've gone to trial so many times that procedure is ingrained in them. They know the value of the case. They respect their adversaries. They honor their word. They know what in the hell they are doing in ways that too many other jurisdictions miss the boat on. And since Hurricane Harvey, your prosecutors have been absolutely killing it. I'm not just talking about keeping intake up and running through the storm. I'm talking about the aftermath. The past five or six months where they have had to drag buckets of cases to various and sundry makeshift courtrooms across the county. They have had to keep up with their Discovery obligations and learn a little bit of eFiling in the middle of all this too. They literally work around the clock on their jobs. It has not been unusual during post-flood conditions for prosecutors to answer texts, emails and phone calls late into the evening. I got a (timely) Discovery notice the other night from a prosecutor at 11:45 p.m. I've seen prosecutors lug additional files to court so some defense attorneys who really really really hate driving in the Galleria area wouldn't have to come to your Office. I've had two prosecutors drop Discovery off at my house. I've had another let me come talk to her about a case at her house. For a displaced group of prosecutors, they couldn't be more accommodating or professional. They do their jobs and do them well because they love what they do. You should be proud. Actually, you should be honored to lead such a group. But I kind of get the impression that you aren't honored. I keep seeing and hearing more and more horror stories about folks in your upper admin who treat your rank and file prosecutors like untrustworthy idiots with bad judgment. I keep seeing more and more outstanding prosecutors leaving Harris County to go to Fort Bend or Montgomery or Travis County. I know of others praying to get on with the Feds. They don't want to leave the prosecutorial profession. They just want to leave you. That's a shame, because I'm really a big fan of your outlook on the Criminal Justice System. That's why I voted for you. That's why I normally defend you when the media is looking for somebody to give a negative sound byte about you. I know we had our differences on the whole David Temple thing, but on the whole, I still like your policies. But dammit, Kim. You have got to start treating your prosecutors better. They've been through a lot and they've made you look good in the process. It's time you started treating them like the highly skilled professionals that they are. And the first thing you need to do to make that happen is have a little chat with JoAnne Musick, your trial bureau chief. I've known JoAnne since I was a baby prosecutor back in 1999. She was the misdemeanor chief of Court Six (I believe) back then and we were friends. It's a good thing we were friends back then, because I saw the way she treated people she didn't like. She was one of those chiefs who picked a favorite in her court, and God save you if you weren't it. I watched her nitpick the living hell out of prosecutors she supervised and then share her scathing reviews with all who wanted to hear. She was a career prosecutor back then. She bragged about how she was "raised on the knee of Johnny Holmes" and she acted as though she was heir to the throne. Don't get me wrong. JoAnne was good at her job. She was smart and she liked to teach. But that mean streak, man. You didn't want to run afoul of that. When plans changed for JoAnne, she moved to the defense bar. Now, as someone who initially believed himself to be a career prosecutor, I can tell you that the change to the defense attorney can sometimes be a little awkward at first. It wan't for JoAnne. Within the space of one job change, JoAnne's D.A. "family" became known as the vilest group of liars and unethical cheats known to mankind. The razor sharp tongue and opinions that she once used only on confused Misdemeanor Threes suddenly were being applied to the entirety of the Office. She was so angry towards the Harris County District Attorney's Office that her former co-workers honestly didn't know what to make of it. I remember one very senior chief dryly remarking, "I don't know why y'all are so surprised that JoAnne is just as big of a [expletive deleted, but you can probably guess] for the defense bar as she was for us." And of course, the Defense Bar just ate that up. They loved JoAnne and her insightful hatred of where she used to work. To date, she's the only person to serve as President of the Harris County Criminal Lawyer's Association twice. In the spirit of full disclosure (and in case you haven't guessed already), JoAnne and I aren't exactly buddies. We got crossways when I was still with the Office after she left. That got magnified greatly during the whole David Temple case reversal. She was blasting me on Twitter from the HCCLA account. It probably had something to do with the fact that one of her law partners at the time was Temple Defense Team Member John Denholm. Those were good times. Many of us were stunned when JoAnne took a job with your Administration, Kim. After all of the things she had said about prosecutors, cops and victims of crime, we all thought those bridges had been burned, nuked, and spat upon. JoAnne loves being the person in charge and belittling those beneath her. It's like, her thing. Her move to Felony Trial Bureau Chief (replacing the far more respected and liked John Jordan) was right up her alley. She's been going to town ever since she took over her spot, too. Calling out prosecutor after prosecutor over long-disposed cases and demanding explanations as if she were addressing a renegade pre-commit. You can call Harris County prosecutors many things, but "soft on crime" has never been one of them. JoAnne clearly still has the same enthusiasm for belittling those under her as she did when she was a misdemeanor chief. I've heard the way she talks to prosecutors. I've heard about her memos. It is so very very vintage JoAnne. JoAnne isn't talking to renegade pre-commits, Kim. She's talking to seasoned, trained, ethical, professional, stand up prosecutors. Prosecutors who have somehow managed to remain upbeat and together despite all they've gone through after Hurricane Harvey. I wouldn't talk to my dog the way JoAnne talks to prosecutors. And I don't really like my dog that much. In short, Hurricane JoAnne is having a far more detrimental effect on your prosecutors than Harvey ever did. I hope that you'll do something about it. Many moons ago, when you were working for the D.A. 's Office under Pat Lykos, I ran into you at the elevator bank of the CJC. It was in the middle of all that crazy Grand Jury surveillance-era and you shook your head and said, "We really need to go grab a beer and catch up on what is happening around here." Over the months and years that followed, when you and I saw each other around the building and always noted how we still needed to have that beer. We never did have it, and I'm guessing you probably wouldn't want to have one with me now. I understand. But all of this is what I would tell you if we were to have that beer today. You have some of the best prosecutors in the world working for you right now. Treat them with the respect that they have earned and deserve, and they will help you accomplish all of those things that you want and need to do. As most courthouse regulars know by now, the Harris County District Attorney's Office had an embarrassing situation this week after hiring Marlene Bovell, a convicted felon, to be an Assistant District Attorney. Here are the Top 10 Excuses that I think the Office could potentially use in this scenario. So, here we go . . .
for Hiring a Convicted Felon to Be an Assistant D.A. 10. The Office was just feeling kind of self-destructive ever since Drew Rountree left. 9. Someone needed to drive the Justice Trolley. 8. Still had Parental Controls activated on the Investigators' Google accounts, so there was no way they could have ever found out plainly obvious information from the Internet. 7. Hey, if the Trump Administration can employ crooks, why can't we? 6. She told us that she didn't like Keiter, either. 5. She had a law degree and a pulse. Have you seen our attrition numbers lately? 4. She came highly recommended by David Temple. 3. Leitner needed a personal trainer at his intake gym. 2. Denholm smeared ketchup all over the Criminal History portion of her job application. 1. Let's just say that with the way we've been managing our budget, a little check fraud in the future wasn't totally out of the question. It isn't difficult to empathize with the Civil Judges and lawyers who regularly practice at the the Civil Justice Center located at 201 Caroline. When Hurricane Harvey wiped out the Harris County Criminal Justice Center (for the third time), the Criminal Bar showed up at the Civils' doorstep like Cousin Eddie at the Griswolds'. We had no place else to go and the Civil Court judges welcomed us in. That couldn't have been easy. Imagine if someone came to you and asked you to vacate your office for a group of relative strangers. The vast majority of the Civil Judges have been more than gracious hosts. For those that didn't outright give up their courtrooms to bunk up with other judges, the rest have been very generous in sharing their space with criminal court dockets. On those occasions when the Civils have needed their courtrooms back for their own trials and hearings, they have been pretty accepting of the Criminal Courts working their dockets in the front foyer. I'm sure news that the CJC would be closed for six months, wait, I mean a year, no two years, make that two years at a minimum, didn't help the Civils maintain a cheery outlook about the current situation. For two of the Civil Court judges, things reached a boiling point today. 125th Civil District Court Judge Kyle Carter has been sharing his courtroom with the 208th and 209th Criminal District Courts since the flood. 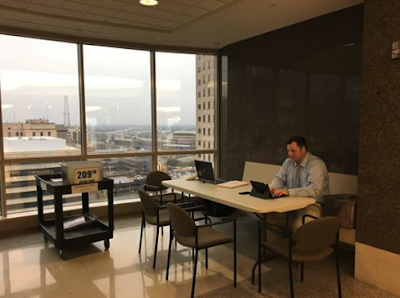 This week, the 208th was in trial, so the prosecutors and defense attorneys with cases in the 209th relocated to the kitchen area behind the courtroom. On Monday, when Judge Carter's staff came to use the kitchen area, they were apparently none too pleased to find the area occupied. Shortly after this, Judge Carter (who, keep in mind, was not the Judge in trial) appeared and wanted to speak to the prosecutor in charge. When the Felony Two responded to the Judge that he was a prosecutor, Carter is reported to have dressed him down in front of his court staff, admonishing him that the next person who was "loud" in the area would be held in contempt. I'm not exactly sure what the grounds would be for holding a prosecutor in contempt. There was no indication that the prosecutors were disturbing any court proceedings. It sounds much more like Judge Carter was just appeasing his staff who wasn't happy about having their lunch space invaded. Apparently, Carter lost sight of the fact that these are taxpayer-funded public buildings, not personal property belonging solely to him and his staff. The prosecutors of the 209th made the decision that discretion was the better part of valor, however. Rather than inform Judge Carter that his threats of contempt weren't, shall we say, legal, they elected to move today's docket to a spot in front of the windows at the end of the hallway. For those of you unfamiliar with the layout of the floors of the Civil Building, please be aware that this is a small alcove at the end of the hallway. It blocks no doors or elevators. There are no violations of the Fire Code. It is simply a table and chairs set up in an area where people are free to congregate in hopes of not offending the delicate ears of Judge Carter. Problem solved, right? Not so fast. Enter, Judge Ravi K. Sandill of the 127th Civil District Court . . . This morning, Judge Sandill was walking down the halls of Civil Building and saw the 209th's set up in the hallway. Apparently, it didn't sit well with him. He inquired as to what exactly the prosecutors were doing in the hallway. They explained the situation to him and he left. He returned a short time later and began taking pictures of the prosecutors. Shortly thereafter, Clay Bowman, the District Courts Administrator showed up to express his displeasure. So, to recap, the 209th can't be in the courtroom because there is a trial going on. They can't be in Judge Kyle Carter's break room because he will hold them in contempt. They can't be in the hallway because it makes Judge Sandill uncomfortable. I'm genuinely curious to see where the Fighting 209th will be tomorrow. Perhaps District Attorney Kim Ogg can requisition a Justice Trolley that just slowly makes circles around the Civil Building. Again, I'd like to point out that the vast majority of the Civil Judges have been nothing less than completely welcoming and cognizant of the fact that the Criminal Justice System is currently operating under emergency conditions. By the way, it is also worth noting that the Judge of the 209th District Court is Judge Michael McSpadden, who has been on the bench for over 35 years. That's longer than Judges Sandhill and Carter have even been attorneys . . . combined. The contested primaries on the Republican side are fewer and farther between than on the Democratic side, due to the fact that many of the benches are held by incumbents. In total, there are two contested Criminal District Court benches (both where there is no incumbent) and two Criminal County Court at Law benches that are contested. Before I get to those, I would like to bring to your attention that former prosecutor and longtime defense attorney Terry Yates is running for Justice of the 1st Court of Appeals - Place 7 against Katy Boatman. I don't know Katy Boatman, but I've known Terry pretty much since I walked in the door of a Harris County Courthouse. I'm a big fan of his, as I am his brother, Denny, and his wife, Judge Leslie Brock Yates. Terry has viewed the Criminal Justice System from both the prosecution and defense sides. He would make a great Justice. Now onto the District Court benches. I will start off by saying that I've dreaded writing about both of these races ever since the fields were finalized. The reason being that in both races, I have friends running against friends. I'm glad that the primary is only a few weeks away, because I look forward to this contest being over. In the 185th District Court race, former Judge of the 176th District Court, Stacey Bond, is running against former Harris County Assistant District Attorney Maritza Antu. Maritza left the Office at the end of 2016 as a Felony Chief prosecutor. She was a talented prosecutor and she has carried on in the world of prosecution as an attorney pro tem on behalf of the State of Texas. She was/is a tough prosecutor, but I always found her to be fair. She, and her husband, Matt Peneguy, are family friends and our kids go to school together. Stacey Bond was a phenomenal judge during her entirely-too-short tenure as Judge of the 176th. She was a victim of the Democratic sweep of 2016 despite being highly regarded by both the State and the Defense. Prior to becoming a judge, she was a former Harris County Assistant District Attorney and a longtime Defense Attorney. I practiced in her Court regularly, and it was truly one of the best courts to work in (even with that mildly cantankerous court coordinator). Stacey had compassion, knowledge, and the guts to make tough decisions. I have nothing negative to say about Maritza, but Stacey was one of the best judges I have ever practiced in front of. In the 263rd District Court race, former Harris County prosecutor Justin Keiter is running against longtime Defense Attorney Charles Johnson. I've known Charles since I was a prosecutor and have always enjoyed working with him. In my experience, he is professional, diligent and caring about his clients. He is laid back and would exercise great judicial temperament. Justin (who is normally referred to just as Keiter) is a former prosecutor who is also currently practicing as a defense attorney. Keiter's demeanor as a prosecutor was something that can probably best be described as "die hard." He was very vocal about his job and his cases and that sometimes tended to rub the Defense Bar the wrong way. I should know. I was his Chief. As Keiter's chief, I saw a side to him that most people who only saw him in court did not. He was one of the hardest working and most dedicated people that I ever supervised during my tenure. He wrapped himself up in his cases and fought hard for the victims on those cases. He was passionate, almost to a fault. Okay, sometimes to a fault. But that was because he was so driven to see that Justice was done. Those who bothered to get past the verbal sparring that came with dealing with Keiter in court were often surprised to find a compassionate and reasonable prosecutor. He was also a talented trial attorney when it came down to it. Keiter is also probably one of the most intensely loyal friends I've ever had. I had a lot of preconceived notions about him when I first began supervising him, but those all changed the more I got to know him. He has a perspective into the System that he isn't given enough credit for, as well as a tremendous amount of compassion. Although I know some in the Defense Bar may disagree, I believe he would make a very good judge. I've already written at length about the pros and cons of the candidates in the nasty battle for County Court at Law # 8, where defense attorney and former prosecutor Dan Simons is running against longtime incumbent Jay Karahan. I'm not going to repeat what I already wrote over here. I will just say (as I did in the other post) that Judge Karahan is a very good judge and he deserves to be re-elected. I've got nothing whatsoever against Dan, but Judge Karahan is the clear choice in this race. And finally, in the race for County Court at Law # 11, a longtime prosecutor, Aaron Burdette, is running against a longtime defense attorney, Lori Botello. I have to admit bias on this one, because I know Burdette so much better than I know Lori. He's actually my neighbor. I consider him to be a very good friend and I think he would make a great judge. That's not to say that Lori wouldn't. I don't recall having too many dealings with her during my time as a prosecutor, but I know that she is an active member of the Defense Bar who has a good reputation as an attorney. I'm sure if you have read over this, you may notice that I failed to make an actual recommendation in 75% of the races. That wasn't an accident. I have too many friends running in these races, and, as I noted in my write up on the Dems, this blog isn't worth losing a friend over. Feel free to share your insights. Just keep them above the belt. With the Democratic sweep of 2016 in Harris County, it is not much of a surprise that candidates came out of the woodwork to run for the remaining judicial benches in 2018. With one exception, all of the Dems running for Criminal District Court benches are uncontested. One of the three Juvenile District Court benches is contested in a three-way race and seven of the Criminal County Court benches are contested. In the vast majority of these races, I have nothing negative to say about the candidates, other than noting years of experience and dedication to criminal law. In a few of the races, I have a friend running against another friend. I'm not going to pick favorites in those races. This blog is definitely not worth losing a friend over. Before I dive into the contested criminal benches, I do want to point out that we have at least three attorneys with ties to our CJC world who are running for either Civil or Family Court benches. In the 234th District Court, Harris County Assistant District Attorney Lauren Reeder is running in a contested primary against Jeff O'Dea. I don't know anything about O'Dea but I'm a big fan of Lauren's. Lauren got her start as a lawyer in the Civil arena, although she's been a prosecutor for awhile. As a prosecutor, she is diligent, fair and kind. Those are the qualities that would make her a great judge regardless of what type of bench she is running for. In the 269th District Court, HCDA Alum Cory Sepolio is running in a contested primary against Shampa Mukerji. Again, I don't know anything about Cory's opponent, but Cory was a good prosecutor who is doing great in the civil arena. He's also a good friend and a great person. He would also make a fantastic judge. In the 280th Family District Court, Harris County ADA Beth Barron is running for the Democratic nomination against Barbara J. Stalder. I could fill an entire blog post on how highly I think of Beth. She has devoted almost her entire career as a prosecutor to handling family violence cases, and she started at that Office long before I did. For years now, she has been handling Protective Orders exclusively, which means she's been working in the 280th on a daily basis, helping secure legal protection for women (and sometimes men) in abusive relationships. I've dealt with Beth on a professional level and I am also proud to call her a friend. She is uniquely qualified for this position and if you are voting in the Democratic primary, I hope you vote for her. Now, onto the District Court bench . . . The 185th District Court appears to be the only contested bench on the felony criminal side, and that race pits HCDA alum and current defense attorney, Jason Luong against attorney Brennen Dunn. I don't know that I've met Mr. Dunn, but his attorney profile on AVVO.com indicates that he practices several branches of law in addition to criminal law. There's nothing wrong with that, but Jason has devoted the entirety of his career to criminal law. He was a prosecutor and now a defense attorney. Criminal law is what he deals with every day. Additionally, Jason has been practicing for 17 years, compared to Brennen's 7. Jason Luong is unquestionably the more qualified candidate in this match up. And the County Courts . . . In the County Court at Law # 2, Defense Attorney Harold Landreneau is running against Ronnisha Bowman. Here again, Harold devotes the vast majority of his practice to criminal law while Ronnisha only lists 20% of her practice as being devoted to criminal. She includes personal injury and entertainment law as other practice areas. Additionally, Harold has been a licensed attorney over twice as long as his opponent. Harold Landreneau is the more qualified candidate in this race. David Fleischer is the clear choice for this race. In the County Court at Law # 7, Defense Attorney Andrew Wright is running against Danval Scarbrough. I've never heard of Danval Scarbrough, which isn't surprising considering the fact that (according to AVVO), he doesn't practice criminal law. When it comes to elections, nothing is more infuriating to me than a lawyer who runs for a bench in a field he or she knows nothing about. I suppose the desire to be called "Your Honor" supersedes the necessity for being qualified. By contrast, Andrew Wright has been doing exclusively criminal defense during his ten years of practice. Like David Fleischer, he is a staple of the misdemeanor courts who can be found, every morning and afternoon, trying to help his clients charged with crimes. Andrew Wright (with his Rock Star hair) is unquestionably the best candidate for this race. In the County Court at Law # 11, Defense Attorneys Gus Saper and Sedrick Walker are running against each other. I know both Gus and Sedrick and I like them both immensely. I dealt with Sedrick when he was a prosecutor and enjoyed working with him, and Gus has been practicing criminal law, literally, since I was two years old. Both of these candidates are good men and would be good judges, but Gus has a significant advantage in the experience category. Gus Saper is the best candidate for this race. In the County Court at Law # 12, Defense Attorney Juan Aguirre is running against Cassandra Holleman. Here, again, I don't know Cassandra, but the reason for that is that she does not appear to practice criminal law. As noted above, that bothers me greatly. Making decisions that affect human freedom is not something that should be handled by people who don't know criminal law. By contrast, my friend, Juan, has done nothing but criminal law since being a lawyer. In addition to being a former prosecutor and longtime defense attorney, Juan is also, quite literally, one of the best people I know. He is the embodiment of the first person to volunteer to help whenever humanly possible. He's a devoted husband, father and friend. He would make an amazing judge. Juan Aguirre is unquestionably the best candidate for this race. In the County Court at Law # 13, Defense Attorneys Mike Renfro and Raul Rodriguez are running against each other for the Democratic nomination. I'm proud to call both of these guys my friends and attorneys that I respect. I won't be picking a candidate in this race because either candidate would do a great job. Both have decades of experience with Mike having practiced for 39 years and Raul for 26. Either choice would be great. In the County Court at Law # 15, Defense Attorneys Kris Ougrah and Tonya Jones are running for the Democratic nomination. Kris has seniority over Tonya with his 13 years of practice compared to her 6. Honestly, I don't know either candidate well enough to give any personal insight to their qualifications. I did read this morning that the Houston Chronicle had endorsed Kris after calling him "loquacious" (which I had to ask my wife to define for me), but they also said some very nice things about Tonya. I spoke to Tonya by email a week or so ago, and she seems like a very nice person. I hope to get to know both attorneys better in the future, because they both sound like great candidates. The 313th District Court has a three-way race with attorneys Tracy Good, John Stephen Liles, and Natalia Oakes running against each other. The only candidate that I know personally in this race is John, whom I dealt with during my brief stint assigned to the Juvenile Division back in 1999. He seems like a nice guy, but I don't know much about him other than that. Analyzing qualifications for a juvenile court is a challenge, because the Court handles matters other than just criminal. It also handles CPS issues, and (I think) adoptions on occasion. My understanding is that all of the candidates are routinely practicing in the juvenile courts. I'll just have to leave it to the commenters here to discuss their individual qualifications. 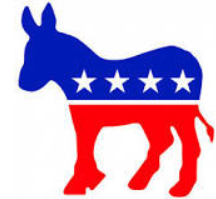 So, that's a wrap for the Democratic side of things. 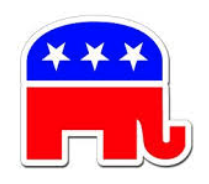 I will try to do a write up on Republicans in the next few days.